Summer is not always the best time for galleries. One of the reasons I enjoy living in Merseyside is that as well as Liverpool being a fantastic city, we are surrounded by beaches. Really beautiful ones. I am writing this after what has been a beautiful June day, warm and summery, the type of weather when you want to spend as much time as possible outdoors. Going for a walk on the beach after work was an opportunity not to be missed. And we are especially lucky to have one beach which is not only beautiful, but home to an interesting piece of public art. Crosby beach has become permanent home to Antony Gormley’s Another Place installation. It wasn’t meant to be. The work had been exhibited on other European coasts and was going to be taken to New York. 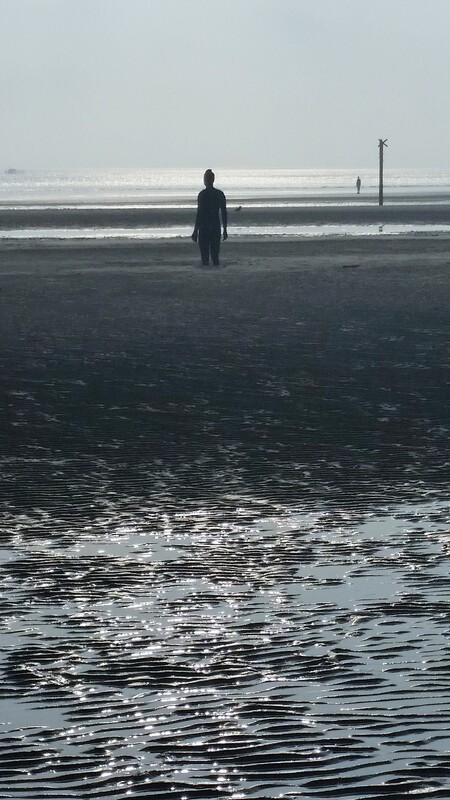 But Gormley agreed with locals that Crosby was an ideal location, and so 11 years later we still have it. Lucky us. It’s great as a tourist landmark, and adds a twist to a trip to the beach for local visitors. For anyone who’s not familiar with it, Another Place is a set of 100 statues of men (casts of Gormley’s own body, in fact). They are all facing out to sea over a 3-kilometre long, 1-kilometre wide stretch of beach. The tide at Crosby goes in and out pretty far, so many of the statues are submerged most of the time, but if you sat for long enough you could see them appear and disappear. I completely understand why Gormley chose to put them in Liverpool in the first place, and then agreed that they could stay. The city’s historical link to migration is so strong, and these statues can represent the hopes, longing and fears of the people who have made these journeys over the years. Walking along the beach this evening, I felt a kind of emotional affinity with the statues. Maybe it was because of the heat, or the sound of ship’s horns distantly calling to and from faraway places, but I was in a dreamy mood. And these figures are all dreamers. I am not sure exactly why Gormley buried some of the statues at various depths in the sand (I think it’s something to do with tide levels), but the one on the right struck me. He’s looking out to the horizon with such hope and expectation, but he’s stuck going nowhere for now. As you can see from the photo he’s beyond the tide level, and at some point he will be sunk again. I can’t be the only person who has ever felt like that. But he keeps dreaming, and so should we. The critics who nearly succeeded in getting the statues removed in 2006 have, happily, been proven wrong on many levels. Nobody has died from being stuck in the sand and the area seems able to cope with the traffic (I can imagine it being busy on a sunny day anyway). As with most art the public value of Another Place as a focal point for fun and contemplation is not measurable in numbers, but in something deeper. Roll on more sunny day trips to the beach. This entry was posted in Home, Let's Talk About It and tagged art, Art History, beach, dream, men, statues. Bookmark the permalink.